What David said: The gang’s all here. It’s that day in January where everyone you know is at Platty, the thing that make it feel like Cheers (even before Apres). 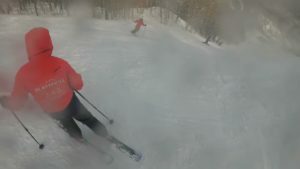 What others said: Ski Block (Block is the mountain’s double black, with the steepest straight vertical anywhere in the Catskills). It’s the way the ones that knew, knew that the guns were going and snow soft was building into bumps. Also I ate it with a 10 maybe more — okay more — foot slide including lost ski (having to put on your ski on an incline of, what, 40 degrees, which is never fun but a good skill) as I skied around dad and kid. 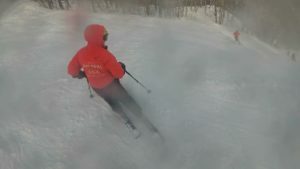 (There is no other way for the young-uns to learn than to get out there and ski it, like that, with parents, parents who as you will see in the pics are fantastic skiers. Which is why Platty too is home to so many amazing skiers). Then in my ignominy, there was my own already-sprained ankle, which made me tentative. 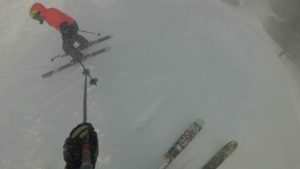 So, a load of excuses from your blogger, but also the best snow and lovely soft moguls forming, plus whales that felt like couloirs and peaks, that demanded you dive down with one swift turn you have to commit to, as if skiing Corbet’s. And the other thing: the snow quality. Shockingly great. It’s no lie that this winter has had its “challenges.” Take getting an awesome foot+ last weekend. That also came with rain and the snow settling into something like cement with a crusty topping (also how I sprained said ankle. It was not skiing. It was snowshoeing which I’d decided was where I should be in the snow that day. Lesson: don’t choose snowshoeing over skiing. Ever.). Today too the bumps forming on skiers’ left of Plunge were super fun. With a bit of hard underneath to throw some challenges into the nice soft 4 inches that the week delivered. 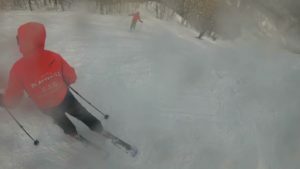 And to ski with Tom (teaches at Vail and retired NYC fireman) and Roman (now head of the Platty ski school and in charge of the art studio at Bard, and an artist whose work “deals with the ephemeral nature of a moment in history and captures fleeting images from news and social media”) made my day. (Your blogger is also an art critic, so that “ephemeral nature” sounds winning. And, there will some day be a post on how the art world is also Plattekill-world but today it’s just how the mountain is skiing). Roman is also a technically amazing skier. And, to ski with Isaac (my fellow blogger and also a writer and who grew up skiing in Idaho from whence he hails, skiing and loving small areas like Platty, but who–dark secret – spent his 80s skiing to a mix that included the Go-Gos and Bananarama.To which later he and I mimed dancing in the bar. Sorry there are no pictures of that. There will be no pics of that. But we did think some après with karaoke would one day be fun. Or embarrassing. Probably the latter). Then the bar. A good bar makes a great mountain, and while I might on a weekday ski other hills in the Catskills, their bars do not have my heart. Or my IPA. There’s something about being under the antler chandelier, listening to someone picking some bluegrass on the stage (a tiny platform in the corner) and hanging out with friends all of whom have been congregating here for a decade. This is Platty. It is real. It is heartwarming. It is family. It welcomes families. It is what makes Platty home for so many. 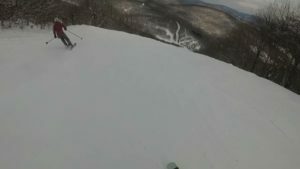 PLATTEKILL FEATURED IN POWDER MAGAZINE! Come on Out for Holiday Week–Starting Tomorrow! The calendar says it’s still Winter, so does Plattekill Mountain! “Blood, Sweat and Tears.” And Guns.